1 PREP Wash and dry all produce. Pat chicken dry with a paper towel. Season all over with salt, pepper, and half the chili powder (1 packet). Trim, then thinly slice scallions, separating greens and whites. Drain pineapple over a small bowl, reserving juice. Halve Thai chili lengthwise, then thinly slice. TIP: Remove the ribs and seeds for less heat and wash your hands after handling. 2 COOK RICE Melt 2 tbsp butter in a small pot over medium-high heat. Add pineapple chunks and scallion whites. Cook, tossing occasionally, until just softened, about 1 minute. Stir in rice, 1¾ cups water, and salt and pepper. Let come to a boil, then reduce heat to low, cover, and bring to a simmer. Cook until tender, 12-15 minutes, then let stand off heat, covered, for about 5 minutes. 3 COOK CHICKEN. Heat a large drizzle of oil in a large pan over medium-high heat (we used nonstick). Add chicken and cook until browned on bottom, 5-6 minutes. Flip and cook until browned on other side, 3-4 minutes more. Meanwhile, add barbecue seasoning, jam, remaining chili powder, 1 tsp sugar, and vinegar to pineapple juice in bowl and stir to combine. 4 COOK GREEN BEANS Place green beans in a medium microwave-safe bowl with 2 TBSP water. Cover bowl with plastic wrap and poke a few holes in wrap. Microwave on high until tender but still bright green and a little crisp, 2-3 minutes. Drain and toss with 2 TBSP butter. Season with salt and pepper. 5 MAKE SAUCE. Once chicken is browned on both sides, add jam mixture and stock concentrates to same pan. Flip chicken to coat all over. Let jam and stock mixture simmer until thick and glaze-like, 1-2 minutes. (TIP: It’s ready when it coats the back of a spoon.) Remove pan from heat and add 1 TBSP butter, stirring to melt. Season with salt and pepper. 6 PLATE AND SERVE. Fluff rice with a fork, the divide between plates along with chicken and green beans. Drizzle any remaining glaze in pan over chicken. Garnish with scallion greens. 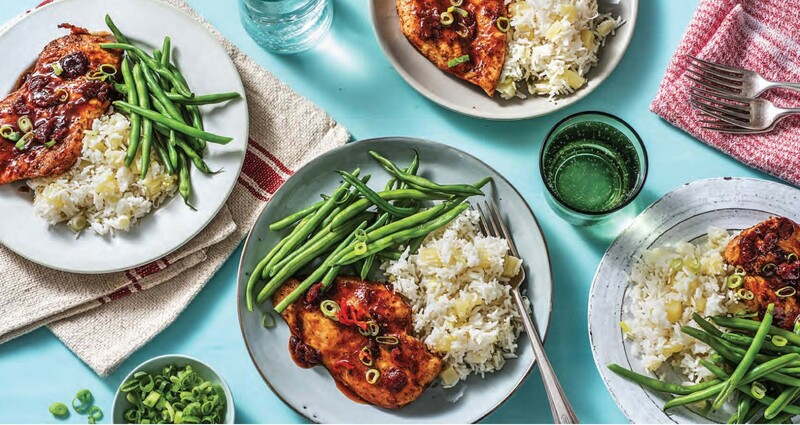 Sprinkle Thai chili over chicken (to taste—leave it off the kids’ plates). « Stuck in Your Home?